A paper published today in Biogeosciences finds that prior claims about the effects of ocean "acidification" on calcifying plankton are highly exaggerated because the artificial laboratory conditions utilized do not correctly simulate the effects in natural seawater. The authors find exposure of the plankton to "acidification" from elevated CO2 concentrations of up to 3247 ppm [over 8 times higher than the present] had no effect on the life cycle (population density, growth and reproduction) of calcifying plankton when natural buffering sediment was present in the experiment. The paper adds to several others invalidating the vast prior literature on the effects of "acidification" as overblown due to biased, artificial laboratory conditions [often just putting sulfuric acid in an aquarium] that don't correctly simulate the buffering effects of a natural environment. Needless to say, the effects of increased CO2 on non-calcifying plankton are 100% positive due to CO2 fertilization. Abstract. 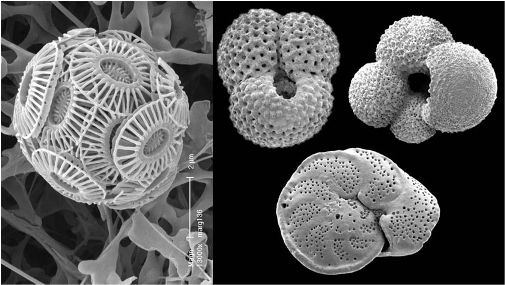 Calcifying foraminifera are expected to be endangered by ocean acidification; however, the response of a complete community kept in natural sediment and over multiple generations under controlled laboratory conditions has not been constrained to date. During 6 months of incubation, foraminiferal assemblages were kept and treated in natural sediment with pCO2-enriched seawater of 430, 907, 1865 and 3247 μatm pCO2. The fauna was dominated by Ammonia aomoriensis and Elphidium species, whereas agglutinated species were rare. After 6 months of incubation, pore water alkalinity was much higher in comparison to the overlying seawater. Consequently, the saturation state of Ωcalc was much higher in the sediment than in the water column in nearly all pCO2 treatments and remained close to saturation. As a result, the life cycle (population density, growth and reproduction) of living assemblages varied markedly during the experimental period, but was largely unaffected by the pCO2 treatments applied. According to the size–frequency distribution, we conclude that foraminifera start reproduction at a diameter of 250 μm. Mortality of living Ammonia aomoriensis was unaffected, whereas size of large and dead tests decreased with elevated pCO2 from 285 μm (pCO2 from 430 to 1865 μatm) to 258 μm (pCO2 3247 μatm). The total organic content of living Ammonia aomoriensis has been determined to be 4.3% of CaCO3 weight. Living individuals had a calcium carbonate production rate of 0.47 g m−2 a−1, whereas dead empty tests accumulated a rate of 0.27 g m−2 a−1. Although Ωcalc was close to 1, approximately 30% of the empty tests of Ammonia aomoriensis showed dissolution features at high pCO2 of 3247 μatm during the last 2 months of incubation. In contrast, tests of the subdominant species,Elphidium incertum, stayed intact. Our results emphasize that the sensitivity to ocean acidification of the endobenthic foraminifera Ammonia aomoriensis in their natural sediment habitat is much lower compared to the experimental response of specimens isolated from the sediment. I'm so impressed when "learned" scientists cannot tell the difference between and acid and a base. The ocean is in the base range. It cannot become "more acidic" when it's not acidic in the first place. Given this lack of honesty/knowledge, it's small wonder it's predicted that CO2 will harm the ocean. Good to see someone looking at natural habitat and not just lab specimens. That's not the point. All water solutions have H+ ions and OH- ions. "More acid" just means more H+ ions and fewer OH- ions. It has nothing to do with the artificial names "acid" or "base". The point is, the change in pH is lower, whether from 9 to 8 or from 5 to 4. WSJ: "Warren Buffett, Climate-Change Denier"